Many people working to improve their health and well-being are very food-focused and like to manage much of their health through diet – and rightly so. However, good health cannot come solely through diet alone (that’s why there are 9 Factors!) and certainly not at the exclusion of the many other lifestyle factors which go hand-in-hand with dietary changes. This is none more true than for sleep. A good night’s sleep, every night, is critical for ALL aspects of your health. There is no part of your biology which can function optimally, even if you eat and exercise well, when your sleep is off. 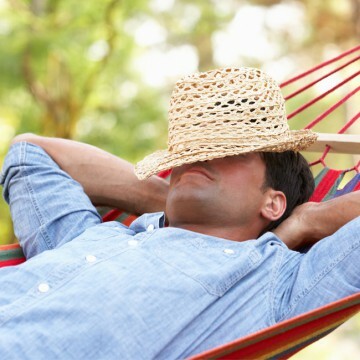 Certainly you can feel okay on suboptimal sleeping patterns if you are eating well and you are keeping your body fit through low-stress exercise. But okay is not the same as optimal. (How many people to do you know that swear they do “just fine” on 5 or 6 hours of sleep?) “Okay” is only a bit better than average and, let’s face it, when you look around, “average” isn’t a particularly high standard these days. Most people actually agree and recognise that sleep is important. But most people I present sleep workshops to seem to be largely clueless as to how to fix their sleep. Their hope, in most cases, is that they just go to bed one night (usually after watching all the late shows), fall into a deep sleep within minutes, and wake up the next morning, on time, and thoroughly refreshed. If only. The biology of sleep is much more complex than this. To sort through the common sleep issues and to improve sleep it takes, at the outset, a similar set of planning, dedication, and focus as does a successful exercise routine. Yes – I can hear the groans from here Down Under. But it is what it is. And like a solid fitness routine, you cannot just rock on up to it 5 minutes before you hope to throw down a personal best – something far too many people attempt to with their sleep. The fact is, there’s much about the quality of your sleep that is predicated on what you do throughout the day, long before you head towards to the bedroom. From your light exposure patterns, to your food, your caffeine intake, the timing of your exercise, and your bedroom environment; all of these factors are intertwined into your resulting sleep quality. The fact that you might have climbed into bed relatively tired, yet cannot fall asleep may very well be linked to what you had for breakfast that morning. Truth. So here are some strategies, which you can put in place immediately, to improve your sleep. These strategies for a good night’s sleep begin as soon as you get out of bed in the morning. In order to set up good rhythms between the hormones which put you to sleep and those which wake you up, you need to get bright, natural light exposure, direct to the eyes, as early as possible in the morning. Without this, (and if your light exposure patterns in the evening are abnormal) it is likely that the hormone which should put you to sleep isn’t high enough come bed time. Plus, it would also be too high come wake up time, thus making it hard to fall asleep and hard to wake up. Getting up and opening the curtains to get the first rays of natural light in your eyes will help suppress the hormone that is making you feel groggy in the morning (melatonin) and will help boost the hormone which helps wake you up (cortisol). If you want to be able to fall asleep with ease at night, you need to be able to produce large amounts of melatonin after the sun has gone down. To produce large amounts of melatonin, you need to be able to produce large amounts of its precursor, serotonin. To make large amounts of serotonin, you need to be able to get bright light in the eyes early in the day (see point 1), AND, you need to be ingesting, via your diet, large amounts of the serotonin building block, tryptophan. Tryptophan is an amino acid, found in high-protein foods of predominantly animal origin. Your average cereal-based breakfast just won’t cut it (and will likely make things worse). Having a high-protein breakfast (eggs, anyone?) floods your body with the prerequisite building blocks necessary to put you to sleep at night. So you have had the first burst of light into the eyes just after awakening, and you have sat down for a hearty breakfast of scrambled eggs (I recommend Gordon Ramsay style). Next you need to get more light in the eyes, which can be easily done on your morning commute (or a morning walk if you are lucky enough to avoid the traffic). Since you’re trying to give your body the “this is morning” signal, we recommend against sunglasses on the way to work or school. Let that natural signal come through loud and clear! The light helps you wake up more, but also drives the conversion of your tryptophan-rich breakfast to the much needed serotonin. Want more help sleeping like a baby? 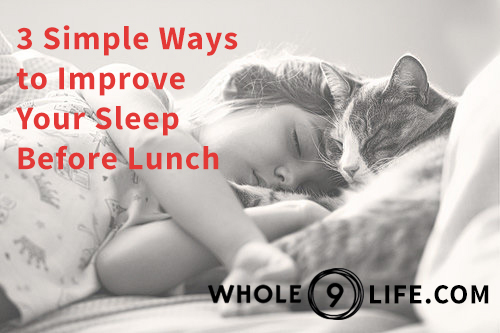 Continue reading with our best ‘after lunch’ tricks! I love these tips and although I think I sleep pretty well for 9 hours every night (sleep schedule, 9pm – 6am), obviously if there’s something even better, I want it! My question is for those of us who live in the Pacific Northwest and get solid grey skies and rain from November to March……..is the regular grungy daylight enough for points 1 & 3 or would we folk benefit from some sort of sun lamp? Even on a cloudy day, the light intensity outdoors is much greater than indoor light. The light intensity of a dark cloudy day (measured in lux) is in the order of 10000. On a bright, blue sky day, around solar noon, it will be 100000+ . In your home or office, even brightly lit, it will be around 500 lux. The light at dawn/dusk is around 500 lux. So whilst your house/office lights might seem bright, and the day outside dark and dim, the reality is that the natural light is still far brighter and exposure to it will help wake you up (that light is also in the correct blue light spectrum, whereas artificial lighting generally isn’t). That all said, especially in the depths of winter, and you tend to suffer from a bit of seasonal affective disorder (winter blues – not the subject of this post), a sunlight could be a good option to trial. Wow, thank you so much, Jamie! That is amazing information, I really appreciate the time you took to send this! That’s a great answer to the question of whether indoor light is sufficient or even better than gloomy outside light (which it’s not). What do you suggest for those of us who get up, shower, cook/clean/eat breakfast and commute in the dark… How do we get ‘bright light in the eyes’ as soon as possible? I guess an artificial sun light? Firstly – please note the spelling of my name – Jamie, not Jaime. The goal is to recognise that there is often a mismatch between the lifestyle choices we make and the inputs and signals our bodies require for optimal health. Yes, in an ideal world, we wouldn’t have to get up before the sun (meaning we would get an extended sleep in the winter months). But as modern humans, living in a world mismatched to our biology, we have to face compromises when we choose certain lifestyles. In this instance, you might not be able to wake up with the sun every morning – not ideal. But having an awareness that bright light early in the morning and throughout the day is important to circadian rhythms, your aim should be to minimise those compromises and get bright light exposure as soon as you can. This might mean that when you arrive at work, you take a couple of minutes, sans dark glasses, to “see the sun” and emphasise regular “bright light” breaks throughout your day. Contrary to some of the Facebook comments regarding this article, living at 43 degrees south, here in Christchurch, New Zealand, first light in mid winter (where we have just come out of), is around 8am – well after we are up and out of bed. Total evening darkness is just after 5pm. We use a bright light alarm clock to wake up to (better than a sound alarm, but still not in the blue light spectrum), and I aim to get out in bright light as soon as I can (even if this means just going to a window in the office and looking outside for a few minutes. I aim to get any exposure I can (even if less than optimal) in order to send that signal to my biology that it is day time and I should be awake now. Without this, it is all too easy for circadian rhythms to drift, leading to being too sleepy during the day, and not sleepy enough at night. The aim of the article is to create awareness around what is ideal so that people can see what choices and compromises they might have to make. Thanks for this article! Organizing my sleep patterns is something I’ve been working hard on. I’m in the Eastern US, and at the moment it’s dark around 7pm, but soon it’ll be 5:30 at the latest. I’m currently getting up around 5:30-6am to get some side work done, and I’m almost always ready to go to bed by 8:30pm. Fortunately my wife is too, so there’s no challenge there. :) My challenge at the moment is waking up without waking her up and then getting light. I start by turning on a 20W lamp in my study, and around 6:15 I turn on a bigger one. That seems to work well, so I thought I’d put it out there as a suggestion for folks who read it. It’s funny – I used to hate waking up early. Anything before 7am was a mental challenge for me. Now, especially in the summer, I love waking up around 6 or even earlier. I end up getting a lot done before the rest of the world wakes up, so I even feel more accomplished! Jamie, I wake up in the middle of the night, every night, after 3-5 hours of sleep. I find it really hard to go back to sleep unless I eat something sweet. Is there any way to get rid of this issue? It’s been happening for years and it’s the only aspect of my health that I haven’t gotten under control. Any information is appreciated! This is one of those questions which really requires a full history to answer. However, my first rule out, given what you have written, is why your blood sugar levels are dropping in the middle of the night. A sharp blood sugar crash will spike cortisol levels (and probably adrenalin), waking you up. These won’t drop back down until you have had some carbohydrate (something sweet) to restore your blood glucose levels. It sounds to me like classic nighttime hypoglycaemia, and is indicative of diabetes (type 1 or 2). If you have not had this investigated by your health practitioner, I would suggest this is the first thing to check. I apologize for the back and forth, but I’ve already checked for both Types of diabetes. I don’t have either. Could it be that I’m non diabetic, with high insulin resistance? I apologize for the multiple questions, and appreciate your answer. Again, not something that I can diagnose via such a forum. Insulin resistance could be a factor. Exacerbated by many factors with meal construction and timing. There are consultants you can engage with on this site. Else suggest you discuss with your doctor. Start with making sure the sleep you do get is the best sleep you can. Since you’re up at night for 7 days, and the lights will be the “sun” to you, make sure your room where you sleep is as “night” as it can be. Black out curtains, covering up the lights, etc. Then the hardest part will be the transition days. My father in law does this, and frankly I don’t know how he can do it! I’d also maybe start meditating a bit to calm your mind, which might make the transition days easier. You said you “try to eat 80% paleo”, but since your sleep is already jacked, I’d look for ways to eat even cleaner. Find ways to build it into your lifestyle instead of allow it to be something that you do when it’s possible. Don’t overdo the exercise; maybe long walks are all you need right now. You didn’t mention what your goals might be, so I’m just assuming maintaining a certain level of health. I can only be very general here based on the information. You are right in suggesting that you may be best served finding a new schedule. But in the absence of that, I’m afraid such a schedule affords you no leeway. You will have to be close to 100% for all the major components of your lifestyle else you will be punished for even small indiscretions. Ensure your sleep environment is top notch, and you may need to look at polyphasic sleep. Keep 90% of your activity at low intensity – lots of walking. If you do any strength work, then I’d suggest a very low volume programme such as Dan John’s Easy Strength. You may have a very brief window in the middle of your week off to string 2-3 higher-intensity workouts together. But keep this intensive rather than extensive – short sharp 10 minute burst would be plenty. Good food, bright light, light activity, and good friends will be the key to coping with this. Just don’t be fooled into thinking you can do 80:20 paleo and still exercise regularly and intensely whilst following this schedule.